I’m over at House that Lars Built sharing some tips on how to fill out an heirloom journal! Click here to read the full article. Truth is, NO ONE CARES. No one cares if I don’t post to this blog each week even though I’m desperate to do it. No one cares if I miss a day posting to Instagram. No one cares about your perfection because everyone is too wrapped up in trying to be perfect themselves. So stop letting your fear of imperfection get in the way of documenting your story. 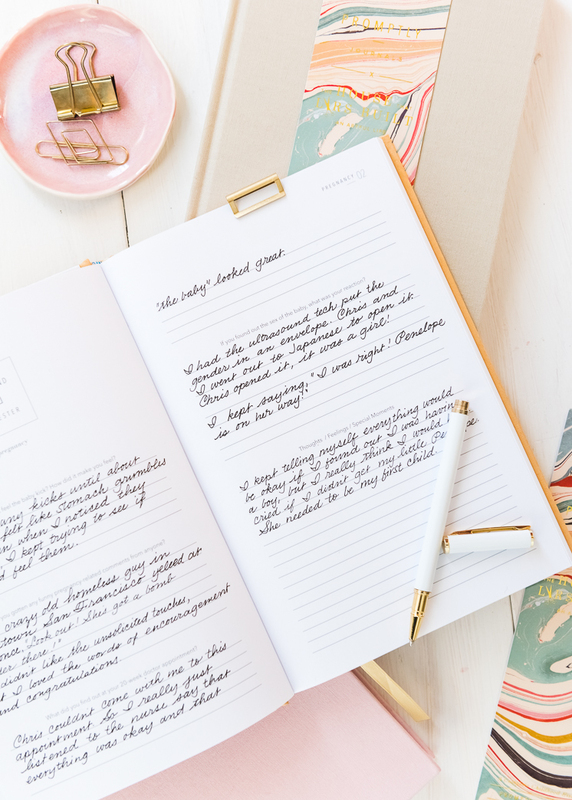 When it comes to writing in an heirloom journal, you may be worried about correct spelling and grammar or beautifully funky penmanship. DON’T BE. Get the stories out, write them to the best of your ability. Understand that those who come after you to read what you wrote are either not going to notice your flaws or embrace them and love each one because it’s proof of your living, breathing humanity. You should embrace it, too. Bonus tip: When writing in a journal or filling out limited spaces, try to go for a finer point pen than a medium or bold point pen. A medium point pen will, perhaps, make your handwriting look nicer sometimes; but a medium pen is often too large a size point in order to fill out baby stats and what-not. Check out all 6 tips over at House that Lars Built! Now let’s talk hand-lettering!! Calligraphy and hand-lettering can be intimidating. Especially if you’re just starting out and teaching yourself. That’s where the humble, yet mighty pencil comes in. The pencil’s got your back. In fact, I have my online class students pull out the pencil before they touch any kind of pen or marker. The master penmen use pencils, so you can, too. I’m really excited to have shared this fun and simple technique on KSL’s Studio 5 on how to incorporate pencil lettering into your every day creativity. Let’s do this, shall we?!? Isn’t this a fun card? You can totally make this in about 10 minutes. Paper – use a mixed media paper if you’re using watercolor pencil. Ruler – you gotta draw light grid lines or your lettering will be all over the place. Clear grid rulers are my fave. Pencils – I’ve teamed up with General Pencil to create a pencil lettering kit, try it! It’s great. Brush – I like small round brushes for this, but any brush you have on hand could also work! Step 1: Cut down your paper to size. I’ll leave it up to you as to what size you want to trim it down to. Get a ruler and mark out your top and bottom lines. The master penmen use a ruler to mark out guides, you should too. Lightly draft out your message. I find that short words in this style work best. Also, when drafting out your letters, make sure they’re generously spaced apart. Because we’ll be outlining around each letter, you’ll want to make sure you give yourself enough room for those outlines. Grab a watercolor pencil and roughly mark out the outlines with watercolor pencils. For the sake of this style, pick two colors that you’d like to go together. Use the darker of the two colors for this part of the outline. Wet a small round brush (this is a size 2 round) and smooth out the outline of your watercolor pencil. Leave a little bit of white space and outline each letter. I love the General’s draughting pencil for this. It’s hard enough to maintain a stable line, but it’s smooth and dark. With your lighter color, outline the right-hand and bottom sides of your outline. You’ll use a light touch to lay down pigment to not disrupt the draughting pencil layer. Using the same wet round brush, smooth out and soften the drop shadow you’ve created. Once the watercolor is dry, erase away guidelines carefully. I like to use the corner of the eraser. Bam! You’re done. You can send it as-is, or you can trace over the darker pencil marks in pen or marker to make the layout pop even more. This tutorial is free for personal use. Affiliates are used to link to products I actually use and have. Your support here makes more content possible. Thank you! Another YouTube video coming at you this week! It’s taken me forever to get this post out, the end of school stuff just took so much out of my week last week. So here we are posting late. If you want to stay up-to-date on new videos, subscribe over on YouTube! I’d love to see you over there. You can expect to see product reviews, art tutorials and time-lapse/real-time calligraphy work. HEY!! Use code Melissa15% at myprimaplace.com for 15% off your order. I tried the Prima Watercolor Confections for the first time with this flower set and I’m loving how the colors blend, lay down, dry and mix. They’re just lovely. And aren’t these little tins just the cutest things ever?!? Start by using your largest brush and mix a light yellow green, bright yellow, and yellow orange. You’ll want all three colors mixed before you start. Lay down brush marks in a circle with the light yellow green. As you make a larger circle (keep it uneven), start picking up the yellows, then as you get to the outside of the flower, move on to the yellow orange. Allow the colors to melt into each other creating a subtle gradation from green to yellow to orange. Next, use the size 6 brush and a darker version of your orange to create smaller concentric circles around, creating the shadows. While you’re waiting for the flower to dry, add the foliage. Work and frame your flower by branching the foliage back into the flower. Now get the liner brush with the same color, or just slightly darker (not by much) and add the details to the petals and darken up the concentric lines and the greenery in the middle. Add any other decorative bits and you’re done! Try changing up your perspective for a full bouquet of ranunculus! I hope you give this tutorial a try. I’d love to see your work if you do! Tag me (@melissapher) on Instagram or message me here if you end up trying this technique out! This tutorial is free for personal use. Affiliate links are used to products I actually use and have. Your support here makes more content possible. Thank you! As requested by a couple of you fine folks who actually read this blog still (thanks, by the way!! ;)), I’m presenting a video with info on the Phantom Reflections Liner. This thing is a bit tricky. If you don’t get it quite right, you’ll have just slightly wonky lines that will make your work look just barely off. We don’t want that, do we?!? I mentioned it in my review of the laser square. I mention that the reflections liner is not that great. And it can be quite frustrating to use. But there definitely is a place for it. You need a well-lit area. You have to look through the viewing glass at the right angle in order to really see the angles, so that changes your orientation some. Looking through the dark viewing glass for hours can strain the eyes. It can feel bulky to use. It’s old-school technology that doesn’t require batteries! You can break it down for easy storage. It’s great for opaque or dark papers. It’s basically like an analog teleprompter to broadcast your guidelines onto your paper. Brilliant little piece of equipment, right? Check out the above video for the full break-down of how to set it up. If you liked this video and others that I share here, consider giving my YouTube channel a subscribe! Check out my online pointed pen class (aka for learning “Modern Calligraphy”) over at calligraphy.org. I teach all sorts of things like how to understand the foundations, push your style so that it’s still readable and how to address envelopes. The class includes images, videos, text and one-on-one feedback from me & my co-instructor Erika. We help you troubleshoot, keep you motivated to continue through the coursework and answer any questions you may have. Feedback includes additional images and videos to help clarify and encourage. Register for my online class today. Affiliate links are used, your purchases support additional videos and posts! Thank you!